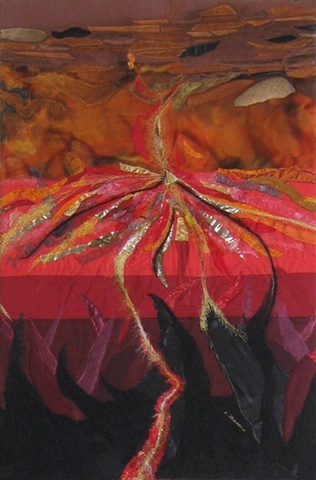 LindaThiemann ... Fine Art Created with Fiber - "Hell"
Six horizontal strips of graduated color were sewn together as the backing for this piece. An assortment of fabrics cut into small random shapes and sizes were fused onto the backing, and then free-motion stitching was performed across the surface to more permanently attach the small pieces to the backing. Black roving was used in the "depths" of this place to create the opressive, darkness it is said to have. Use of irridescent materials helped to create the molten, flowing quality.